In the cryptocurrency space, there are different methods of validating a blockchain, and most of these methods are potential opportunities to earn rewards by assisting with the maintenance and security of a blockchain network. The most common method is Proof-of-Work (PoW), whereby the miner who uses their computing resources to solve the next hash puzzle the fastest, will earn a monetary reward. Another method is Proof-of-Stake (PoS), where the user “stakes” their coins to the blockchain network to validate the transactions required to make a new block in order to earn a reward. Proof-of-Service is where a user has a required amount of coins to create a Masternode, which provides an additional layer of security on the blockchain network. Depending on the cryptocurrency’s consensus algorithm, users will be able to earn rewards by one or more of these methods. Energi (NRG) has recently transitioned from a PoW consensus to PoS (as of February 26th, 2019) which has already made a huge impact. Users now have the luxury of Staking their NRG coins onto the network without the hassle of setting up an Virtual Private Server online, outlaying hosting costs and continued updates and maintenance. Staking creates a simple, easy way for users to take advantage of the PoS mechanism to build up rewards and eventually collect enough coins to create a Masternode, should they decide to do so. But what are the differences between Staking and Masternodes? How do they work and how do they both benefit the Energi network? 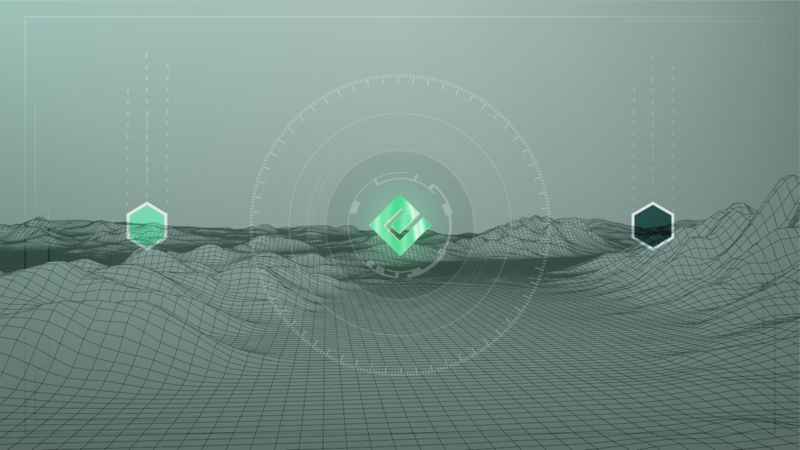 Within this article, we will take a deep dive into the differences between Energi’s PoS and Masternodes, and how both of them provide benefits to the Energi network and its users. Users are now able to Stake Energi in their Energi Core Wallets. Once NRG is stored within the wallet, users unlock (enable) their wallet for Staking and leave their wallet running continuously, connected to the Energi blockchain network. As long as the wallet remains unlocked for Staking and connected to the network, users will be rewarded NRG. 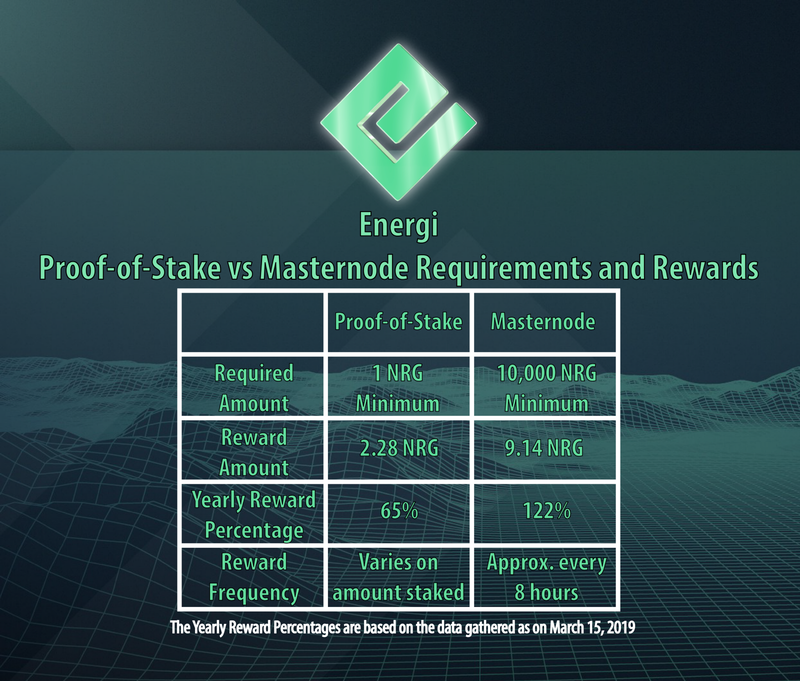 With the relatively easy setup to earn rewards, Energi’s PoS consensus model has attracted many new ‘StakeHodlers’ who are ‘hodling’ their NRG coins for Staking. Energi features a powerful on-chain scaling solution with a system of incentivized nodes called Energi Masternodes. A Masternode is a full node backed by 10,000 NRG collateral that provides level 2 scalability to the Energi cryptocurrency network. Masternodes facilitate the ‘Instant Send’ wallet feature which allows instant transactions, even in times of network congestion. Transactions can be made securely and instantly ahead of the blockchain, as they are approved by a quorum of Masternodes. Instant Send payments enjoy the same immutable transaction history as regular transactions, as they are later resolved on-chain as the network is able to. 40% of Energi’s monthly emissions is allocated to ongoing Masternode payments, providing an extremely strong monetary incentive to grow the number of full nodes, which increases the security and scalability of the network. 2) And the total amount being Staked on the network. 2) The 40% of 1,000,000 NRG allocated to Masternodes every month (400,000 NRG) is not a variable. We have provided a Staking Calculator (link below) to determine how much NRG can be earned at any point in time, when Staking via PoS or Masternode.